Vincent Valentino is a glass half-full kind of guy. And not just because he works at Columbus’ Land-Grant Brewing Company. 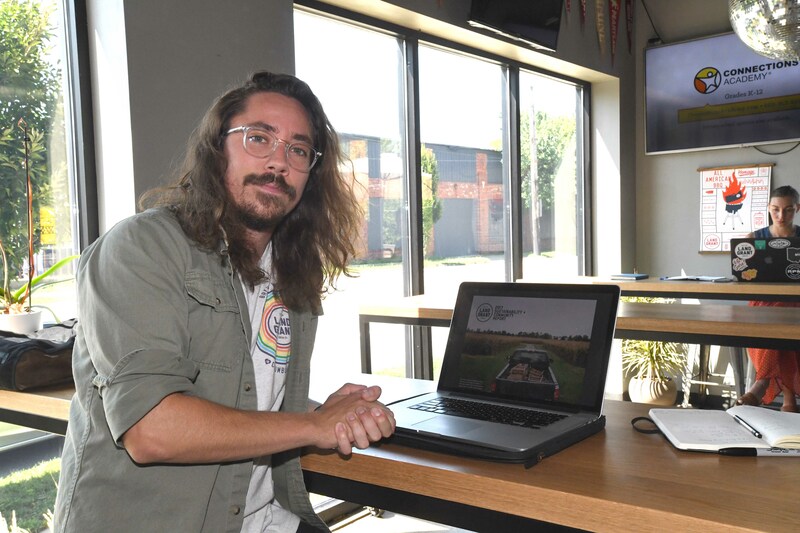 Although the beers are a definite perk of the job, the 2015 graduate of the College of Food, Agricultural, and Environmental Sciences (CFAES) at The Ohio State University is doing his part to make the craft beer industry more environmentally-friendly and sustainable. “Brewing beer requires large amounts of energy, agricultural ingredients, packaging material, water, and labor all to be fermented and poured into a single glass,” he said. 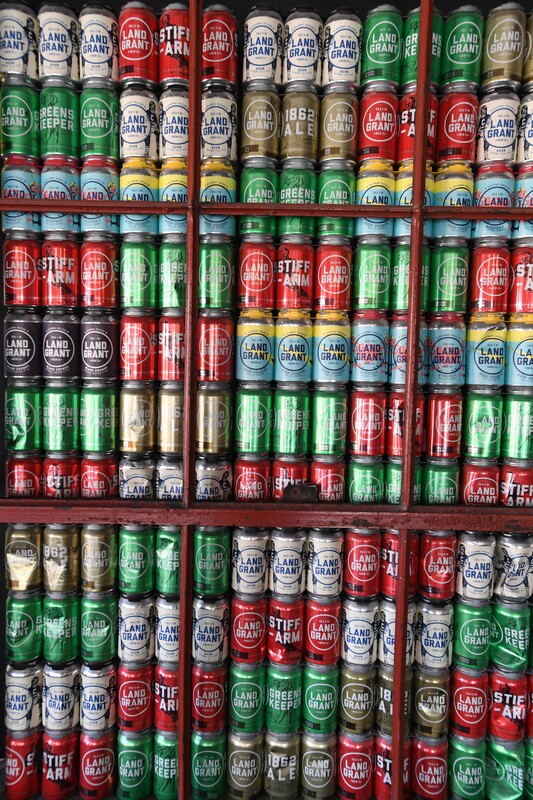 A display of colorful beer cans at Land-Grant Brewery. As Land-Grant’s sustainability manager, he works daily to reduce the brewery’s impact on the environment. But Valentino’s focus wasn’t always so clear. Known as “Vinny” to his friends, the Centerville, Ohio native entered Ohio University after high school where he admits to having three or four different majors during his first year. Also during that time, two major environmental events occurred—the Deepwater Horizon oil spill in the Gulf of Mexico and the meltdown at the Fukushima Daiichi Nuclear Power Plant in Japan. The disastrous environmental impacts from both were extremely unsettling to the university freshman. After some high school friends moved to Columbus, Valentino left the university and headed to the state capital as well. He started taking classes at Columbus State Community College in everything from biology to piano, while playing in a band with friends and working in restaurants to support himself. Older brother Patrick, who was a student at Ohio State, offered some brotherly advice and suggested he enroll at the university. He learned that the acronym stood for Environment, Economy, Development, and Sustainability and that it was a joint program between CFAES’ School of Environment and Natural Resources and Department of Agricultural, Environmental, and Development Economics. As Valentino dug further, he learned that the interdisciplinary CFAES degree focused on the human, economic and environmental dimensions of sustainability. The program included areas such as environmental science, ecological & environmental economics, public policy, city planning, sustainable design, environmental sociology, community development, ecological engineering and business management. He was hooked and knew he had finally found his academic home. While in the program, he also took advantage of the many opportunities Columbus afforded. He completed an internship with the City of Columbus Mayor’s Office that focused on environmental stewardship and the Get Green Columbus initiative. Fingers rock band with Vinny Valentino, pictured far right. Valentino was part of the second class of EEDS students when he graduated in 2015 with his bachelor’s degree. But, at that time, the road (and not a full-time job), was calling. 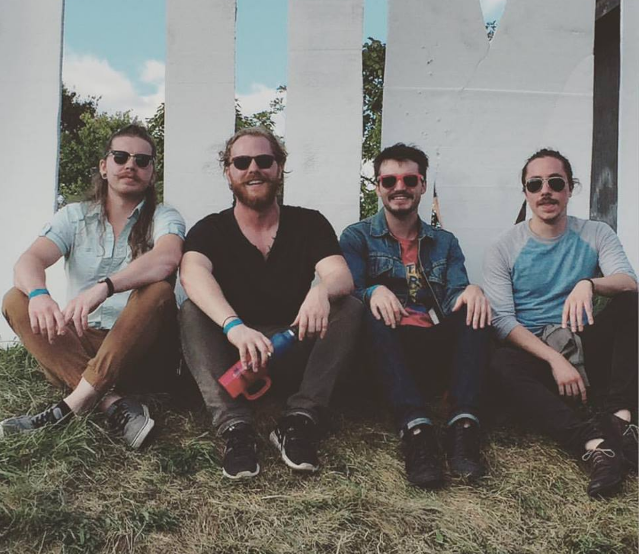 So he headed out on tour with his friends and their rock band, Fingers. The talented musician not only sings and writes songs, but also plays guitar, bass, drums, mandolin and piano. “It was a great time, but we came back pretty much broke,” he laughed. Back in Columbus, Valentino reached out to the director of Ohio State’s Office of Energy and Environment for some career and life advice. “She told me that I had a very transferrable degree, and I finally realized that it truly was,” he recalled. Valentino took a job in Columbus as an energy analyst and sustainable development specialist for the nonprofit Council of Development Financial Agencies, before moving on to work as a state organizer for the Environmental Defense Fund. “I really enjoyed working in grassroots organizing and spent much of my time on campuses talking with college students,” he said. Valentino specifically worked on the Defend Our Future campaign, which engages students about the importance of taking action around climate change, protecting our environment and being politically active. He supplemented that job with part-time bartending and was hired at Land-Grant Brewery in early 2016. It didn’t take Valentino long to notice a few things related to energy efficiencies that he thought he could help improve. So that fall, he approached Adam Benner, co-founder and president of the Franklinton brewery, with a proposition. He pitched his abilities and EEDS training to Benner, who is also an Ohio State alumnus, and found a receptive ear. Benner was very interested in making the small, urban craft brewery more sustainable, but couldn’t devote time to the process with the many other demands on his time. The brewery owner agreed to give the 25-year-old Valentino a six-month trial period to see what he could accomplish. At the end of that time, he was offered a full-time position as sustainability manager and operations assistant. 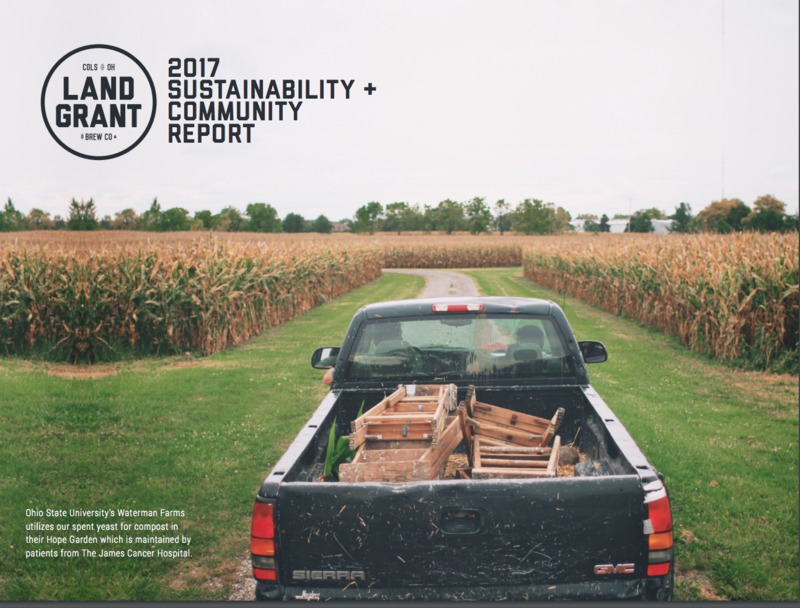 The goal was to steer Land-Grant in the direction of becoming the most sustainable brewery in central Ohio. 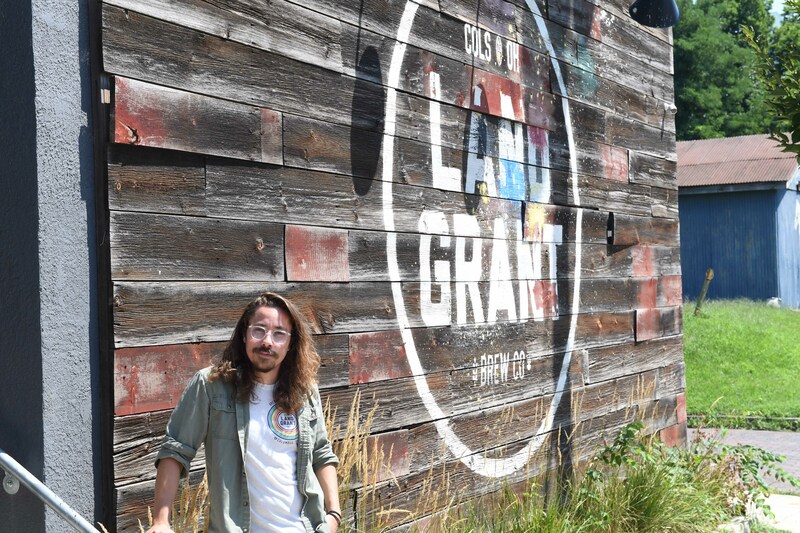 Sustainability manager Valentino outside of Land-Grant Brewery, located in the downtown Columbus community of Franklinton. Craft beer has become a huge business not just in Ohio, but nationwide. According to the Brewers Association, the total number of U.S. breweries increased 16 percent from 2016 to 2017 to 6,372 breweries. Many are relatively small businesses dealing with issues that have a big environmental impact. Valentino’s job at Land-Grant Brewery is to improve energy efficiency, water stewardship and waste diversion. “One of the first things I did was to implement a utility tracking and management system,” Valentino said. “That allowed us to begin measuring our consumption of electricity, natural gas and water, as well as our wastewater flow, solid waste and recycling. “By measuring this utility information, we were able to launch several efficiency projects and measure their impact, to know what worked and what didn’t. He also changed out the entire lighting system in the brewery and taproom to energy-efficient bulbs. “We were able to reduce our energy consumption for indoor lighting by 50 percent and for outdoor lighting by 80 percent, creating substantial energy reductions,” he said. While Valentino calls those early improvements the “low-hanging fruit,” Land-Grant co-founder Benner was very happy with what he was doing, and the trial period was an unqualified success. One of the things Valentino accomplished was writing a 2017 Sustainability + Community Report for the brewery. The 35-page report shares examples of “programs that were created, what worked, what didn’t work, and what we’re going to do about it.” Valentino also split the sustainability program into four “pillars” to better measure and manage efforts: Mitigation of Life Cycle Impact; Reduction of Carbon Footprint; Water Stewardship; and Deep Community Partnerships. For example, the “life cycle” of craft beer starts at the farms where Land-Grant sources the hops and grains that go into its beer, as well as the facilities it pull their malts from. “Malting is a very energy intensive process, so we want to know how our suppliers source their energy,” Valentino explained. “Then these ingredients are shipped here, so what kind of vehicles do our suppliers use? Large amounts of water, energy and labor are required to turn those ingredients into our beer, which in turn is canned or kegged and sent to bars, restaurants, carry-outs, grocery stores and stadiums throughout Central Ohio. Disposing of the byproducts that breweries create while making beer can be a real challenge. Spent grain, spent yeast, and spent hops (known as trub) have to go somewhere. The soft-spoken Valentino visited various farms around the Columbus area to see if they could use those brewing byproducts for their crops and animals. Valentino on the floor of Land-Grant Brewing. Land-Grant is working with Hoffman Farms in Hilliard, Ohio, to use spent grains as animal feed. He also formed a partnership with CFAES to use yeast as fertilizer for the Garden of Hope at its Waterman Agricultural and Natural Resources Laboratory. The same is being done at St. Stephen’s Community House in Columbus’ Linden neighborhood. The partnerships are win-win for all parties involved: Land-Grant uses mint grown at St. Stephen’s and pumpkins from Waterman Farms to flavor its beers, while Hoffman Farms has a steady feed supply. Valentino hopes to continue to grow these community partnerships with Columbus community groups, urban farms and various agricultural groups with the goal of getting all byproduct out of their wastewater stream. In 2017, the brewery was able to divert 1,600 gallons of byproducts from its wastewater. Other projects such as zero waste programs for large events and possible conversion to solar on the brewery roof are underway as well. Always a bit of a renaissance man, when he’s not living and breathing sustainability at Land-Grant, the now 27-year-old Valentino enjoys reading, writing poetry, running and music. And climate change is always high on his mind. “We’re already experiencing terrifying weather changes, but I really believe that we can mitigate some of them. I have a lot of hope,” the environmental enthusiast said. Vincent Valentino at work in the Land-Grant Brewery taproom. Some of that hope comes from his current favorite book, the 2017 New York Times bestseller, Drawdown: The Most Comprehensive Plan Ever Proposed to Reverse Global Warming. The 256-page book offers 100 solutions to reverse global warming based on research by leading scientists and policymakers around the world. Valentino also supports Ohio State, CFAES and the EEDS program, returning to campus as a guest speaker to share his story. 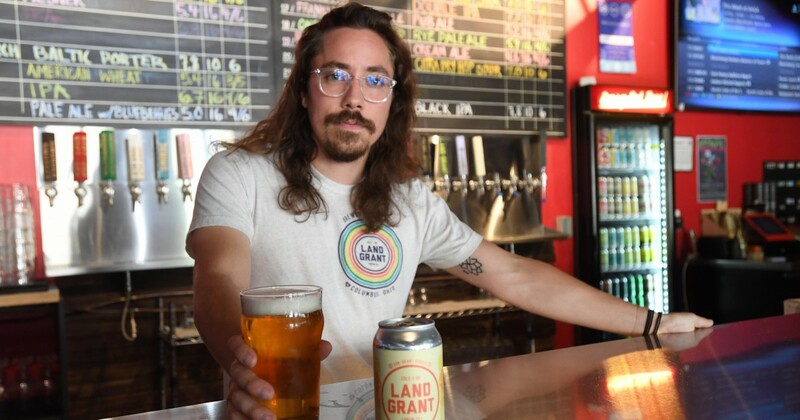 Land-Grant Brewery is looking forward to celebrating its fourth anniversary this November and the former part-time bartender, now full-time sustainability manager, looks to be an important part of its future success. Plus, Valentino can bring added value to the brewery when things get really busy. “I’m always willing to jump behind the bar for a bartending gig, just like old times,” he said. And his favorite Land-Grant beer? That would be Balk Bock, a dark and robust bock beer whose malt and hops “shine in its chocolate and caramel filled glory,” according to the brewery website. But since it was a limited brew that’s no longer available, Valentino’s current favorite is the on-tap Lawnraker, an Oktoberfest Märzen-style ale. Without a doubt, it appears that the CFAES alumnus has finally found exactly where he’s meant to be. (VIDEO) Vincent Valentino describes his Ohio State path and his current role at Land-Grant Brewery.